We would like to take you through a brief overview of our product, Glass Fiber-reinforced polymer (GFRP), rebar to show you how it can extend the life of your concrete and how it may impact you and our country now and in the future. Unlike the Roman concrete roof pictured above, modern concrete no longer lasts 2,000 years. Modern concrete structures frequently need repairs in 10 to 15 years and will generally require major repairs after 25 years. Wherever you are, at home, traveling or at work, you will see concrete which is cracking, rust stained or breaking apart. If you are a taxpayer, a homeowner or a business owner you have an outstanding repair bill waiting. The cumulative total in Canada is estimated at 74 billion dollars. Several possible solutions for this problem have been explored including the use of galvanized, epoxy coated or stainless steel rebar. While intuitively promising, the results of testing such solutions have been disappointing as none of these methods has halted rebar degradation. Glass fiber-reinforced polymer (GFRP) rebar has been proven not to corrode even under extreme corrosive conditions allowing structures so reinforced to last many times longer than steel reinforced concrete structures. Studies in 12 countries and at more than 70 Universities have examined many aspects of using GFRP rebar in concrete. Field studies and laboratory research has concluded that GFRP rebar will dramatically reduce concrete corrosion, cracking and breaking which is caused by steel rebar. GFRP reinforced concrete structures will last from 4 to 20 times longer than steel rebar reinforced concrete structures. 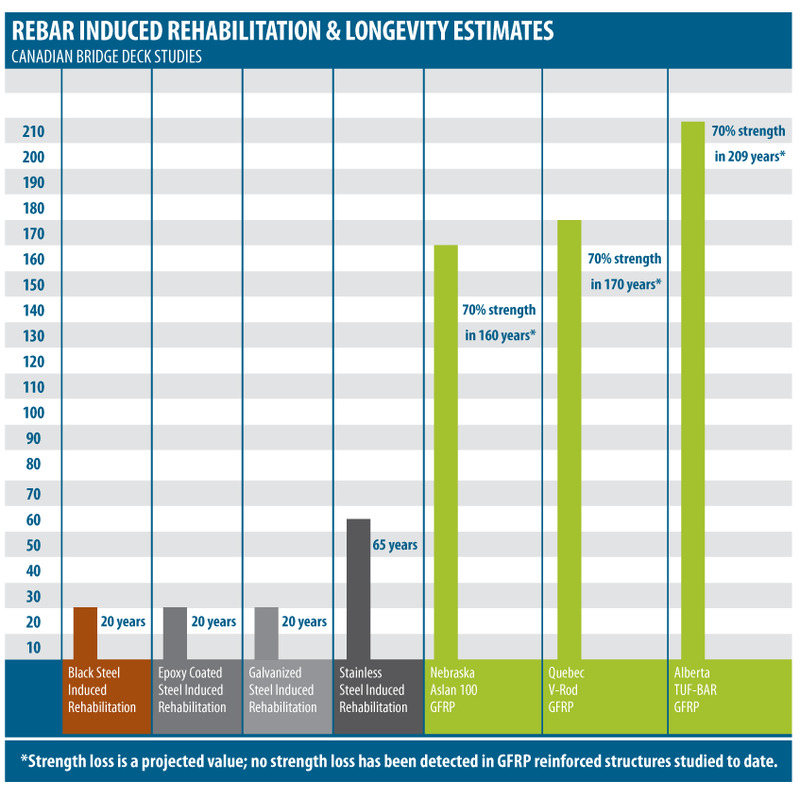 Using GFRP rebar in private, business and government concrete structures today will eliminate costly rehabilitation projects. Why are the Roman concrete structures still standing? One reason is they never used steel re-bar in their structures.